Hi, servus and thanks so much for stopping by today! Today I would like to share with you a painting that was inspired by a lovely trip to Turkey some years back and by one of my actual favorite mixed media art books - Nathalie Kalbach's "Artful Adventures in Mixed Media". What I especially like about Nathalie's book is, that unlike with many other mixed media books it doesn't just give tons of technique loaded recipes that would only have you use tons of different media and tools to follow them (and therefore kind of copy the projects), which leaves little or no room for own ideas or interpretations. On the contrary - her book focuses on getting the ideas first and then pick the right artistic means to transform your ideas into artwork that has meaning and depth. 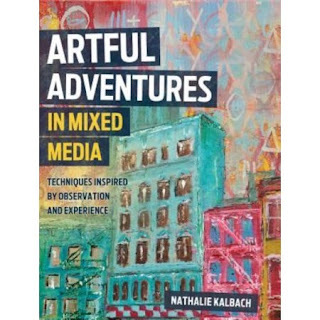 Nathalie's book talks about many different ways on where to draw inspiration from (like from nature, the city, trips to foreign places,...), how to document and collect that inspiration and how to make everyday life's inspiration become the core of your art projects. From my point of view (as a former arts teacher) this is what you need to make your artwork have meaning - because a piece of art only becomes "alive" when there's a story the artist needed to tell with it (be it abstract or more objective). That is what I tried with this little 8''x11'' painting on heavy mixed media paper - to capture a lovely memory from a wonderful round trip through Turkey. There was this village with many beautiful old and weathered wooden doors to abandoned houses and I took many pictures of them. One became the source of inspiration for my painting. I remembered the doors when flipping through Nathalie's book and coming across a page with an amazing door (see image below). So what I did was print a colour copy of my picture for reference (one of the whole door, another of an enlarged detail so I could see the texture that I wanted to reproduce in my painting). To create my background I used DecoArt Chalky Finish paints and a palette knife. I had first marked the area for the door so I could eye-ball where to create the background for the door and the background for the walls. As you can see I let both areas overlap loosely. I mixed some of the paints on my palette sheet, others wet on wet directly on the substrate. I went in with my heat tool to speed up the drying time. Using the Block Door stencil and a palette knife I applied DecoArt media clear Modeling Paste to the door's area. The dry Modeling Paste would work as a resist to preserve the paints underneath from being covered up during the following painting steps. While the Modeling Paste was still wet, I doodled some flowers into the centres of the four door panels with a sculpting tool. Then I left my painting to dry naturally. On my photograph there were stone carvings around the door, so I added some orange Chalky Finish paint in two spots using the stencil from the June 2016 Stencil Club kit. I used the palette knife again (instead of sponging the paint through the stencil) to create a thick layer of paint. The lovely tree from the City Stories stencil was added using DecoArt media black Modeling Paste. As I didn't like to have crisp edges this time and wanted a more painterly look, I took a rubber tip paste modeling tool and smudged the edges. Once the paint and paste had dried, I went in with an aquarellable black pencil and traced some of the door panels' outlines. I also drew the rest of the building. I activated the black pencil lines with clear water using a detail brush. Then it was time to add several layers of paint washes to the door to create depth and make the preserved areas on the door pop out against a darker background. I used DecoArt media fluid acrylic Primary Cyan and kitchen roll to wipe the paint off the Modeling Paste areas while it was still wet. Wiping is better then dabbing, because with dabbing you will also remove paint off the crevices and areas in between again. I have done a short video for you showing me adding several blue wash layers and also using the left overs from the wash on my palette to bring the same colour to other areas on my painting (which always adds more depth and helps fuse a painting really well). You will see me add and wipe back, add more, wipe back again and so forth. Why didn't I just add one thick layer in a single go, I hear you ask? Well, because the look of several light layers will give you better control and a more organic look in the end, whereas the thick wash layer will cover up areas more evenly - which mostly looks quite "flat". Once the wash had dried, I dry brushed the black tree with some brown Americana acrylic paint and the door with a light green-blue and beige. The final dry brushing layer on the door was applied with orange Chalky Finish paint. The leftovers on my palette were turned into a wash and used to shade corners and other areas. To imitate some cobble stones in front of the house I used the small Open Buildings stencil and beige Chalky Finish paint. This time I used a cosmetic sponge to apply the paint through the stencil. Voilá! I was quite content with how my door looked. I know the tree somehow "embraces" the old house from behind (or maybe caresses it)...but actually I love that idea. I found that the area at the bottom of my painting lacked a bit of interest. I remembered one of Nathalie's paintings in her book, that shows some text and stencilled on dots patterns on the ocean in front of Sydney's amazing opera house and I decided to do something similar. I stamped a quote (from a Red Lead rubber stamp) onto some tissue paper and glued the top layer onto my painting using matte DecoArt Decou-Page. To fuse the text area with my painting I lightly scraped some Chalky Finish paint around it with the very tip of my palette knife. I also added scraped on paint to other areas on my painting - repeating the same thing in slight variations in different spots always strengthens composition. Then I finished off my painting with adding some lovely turquoise dots here and there using the small stencil from the October 2016 Stencil Club kit. A final comparison - yesssss! My goal had been to capture the feel of that beautiful weathered wooden door with the ornaments and the contrast of the fresh turquoise against the warm subtle orange of the sandstone, the feel of the dry heat and the gentle breeze there that made it less stingy. I think I can call my goal achieved. Yay! I hope you like my painting too! Thanks so much for being with us today! 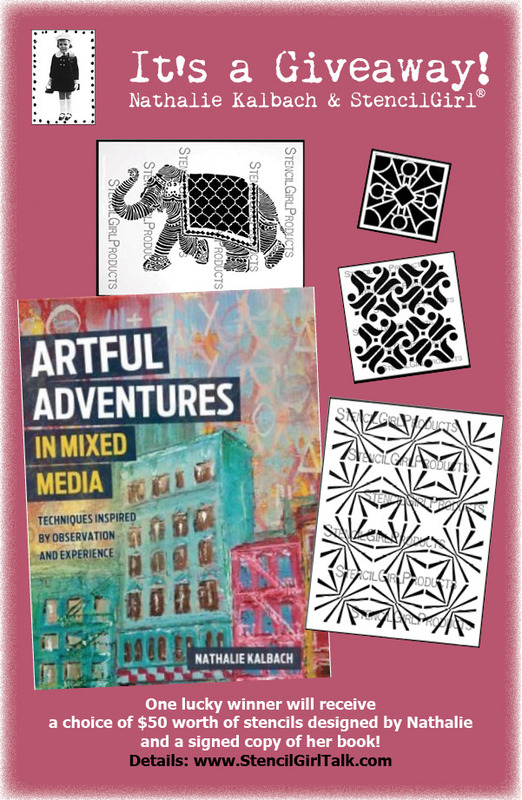 One lucky winner will receive a choice of $50 worth of stencils designed by Nathalie and a signed copy of her book! Enter by commenting below by June 10th, 2018. One winner will be chosen at random on June 11th. Winner notified by email. I love the colours of your door and the final painting is just beautiful. Sorry just read the notes! Love the piece and the colors used, and I love to see what you did with the door stencil too. Thank you for sharing! I love this, I'm amazed at how people can see things and turn them into something so unique because of the emotions they put into them. I took a class with Natalie last year. love her!!! mmpierron (at) yahoo. Awesome! Thanks for sharing the process with us, I love the use of chalk paints for this. This is incredible and so very inspiring <3. Thank you for the chance :). I love the colors and the stencils used in this project! Gives me many new ideas for future projects!! Thank you for sharing!! Oops ... sbw112336 (at) gmail ... thanks!! Amazing result. I'd love a chance to try out her stencils! I love the way you used the modeling paste to create texture on the door and tree. I haven’t tried working with it yet, but you’ve inspired me to give it a try! What a gorgeous piece inspired by a fabulous photo (I love old doors like that - they have so much personality)! I love how you've incorporated the stencils. postalorphan (at) yahoo (dot) com. Nathalie is the bomb. She is always changing and I love her style. I am going to try this technique. Very cool. So fun to see your step-by-step creative process to capture a memory. SmilynStef at aol dot com. Awesome design! Very inspirational. I'm a fan of stencils and other media with architectural images - doors, windows, buildings. Thanks for sharing with us. Love this piece! Your description of your creative process was inspirational. What a beautiful piece of art - thank you for posting it - and fir the wonderful giveaway opportunity! Beautiful artwork! What a awesome giveaway! What an amazing opportunity! Love this piece- so many layers and details. I love Natalue’s Work and find her so inspiring. What an awesome giveaway! Someone gonna be soooo lucky ! Wow! I love the project. I learned a few tips. Thanks for the chance to win. As a door lover, I really like the look of yours. Feeling Lucky. Hope to win! Lovely piece of art. Thanks for the opportunity to win! This sounds like the book I need. Your artwork is lovely as always. I adore doors. Thanks for a chance to win the book. Fantastic piece and thanks for the opportunity to enter the giveaway! Such a beautiful painting! Thanks for all the steps and photos of the process! The giveaway is wonderful!! Crossing all my crossable parts that I'll be the lucky winner!!! I just love this. The colours go so well together and the whole thing is just dreamy. Door just needs to be opened and walked through to experience world out there. Thanks for the Beautiful door which would open wonderful world for one of us. Very cool post! Thanks for the opportunity to win these amazing stencils! The detail and weathered look of the door is wonderful. I do appreciate your sharing of your step by step. I love your work Nat. You are a talented artist and great teacher. Would love to win your book. Wow I'd love a copy of that book,I think it'llhelp me move forward.Thamk you for the opportunity. Lovely work and insane giveaway! Thank you for the inspiration :) Sunny days! Great project. Tha book looks like a must own. Nat! WOW! Looks like a super book-a gotta have! Thanks so much for the giveaway StencilGirl and Nat!fingers crossed! Love her designs - use her elephant stencil all the time! The door piece is lovely. I am just beginning my mixed media journey. I am a quilter first. This book would be a great way for me to find inspiration. Awesome give away. Thanks for sharing your technique. This book looks awesome! Many times I have thought about how to capture the "feel" of a place in mixed media, and Nathalie's work does this! I'd love to learn from this book. Thanks for the chance to win! Great "How To"! Being an artist that draws inspiration from the environment around me and from photographs I take, I always love learning a new technique to incorporate into my work. I am relatively new to working with stencils and this will be another tool in my tool box. Thanks for sharing. Fantabulous work. Love the stencils and your creation. Love your work. What a generous giveaway. Thank you for sharing your process. I will have to give it a try. Great painting - love the techniques!!! Thought your improvising stencils For uses other than their original was a great tip. Would LOVE 🎨💕😎 to win your stencil giveaway. Thanks for offering it. What an opportunity. I have a very difficult time choosing from the many stencils that you guys are producing. I love them all. Be nice to win one. Love your work. Can't wait to win this wonderful prize. Love the ideas of his generated. Would like the book to expand my journaling too! What a great project, love the colours. I have many photographs of doors and windows, this is an excellent way to use them. Beautiful project! I am hooked on taking photos of interesting doors and windows when I travel, too! Thanks for the chance to win! I adore Natalie’s stencils and have quite a few of her stamps also. Great project! Always looking for new books to get inspiration from. "Artful Adventures in mixed media" sounds like a great one. Things for telling us about it. Beautiful piece. You indeed accomplished your goal of creating your interpretation of the door in the Turkish village. Thanks for the very detailed account t of your process. I follow Natalie Kalbach closely and love her work, her blog and her enthusiasm. Awesome colors and textures on this beautiful creation! Love the door design! The book looks inspirational! LOve your piece of art and doors are a favourite subject of mine, along with houses. Would love to win the prize and thank you for offering it. The stencils and book look so gorgeous. Fantastic giveaway! I love your door piece! I'm always attracte to windows and doors. I love using doors in my art. I would love adding this book to my library. You inspired me to try something I've never done; a beautiful door! Your choice of colors and stencils really captured my love of color. Thanks! Wonderful inspiration from Nathalie’s book and a great detailed tutorial...beautiful! So inspiring. I have been struggling with a painting, you tutorial has helped me in so many ways. Thank you!! It would be an extra bonus to win your giveaway. All your colors and layers are scrumptious and the detail of etching the flowers into the door panels adds so much to the whole composition.